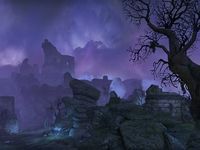 The Shade Perilous is a pocket realm of the Evergloam coveted by many Daedric clans for the harvestable darkling mana present. It was taken by the armies of Mehrunes Dagon during his invasion of the Battlespire during the Imperial Simulacrum. Dagon's protégés, Faydra Shardai and Xivilai Moath, became overzealous and, instead of simply obtaining passage by negotiation, took the Shade Perilous by force. The clanless Seducers who inhabited the realm betrayed the Nocturnal Lieutenant Jaciel Morgen and the lesser Nocturnal Deyanira Katrece, claiming the area for Dagon. The Shade Perilous was left to the Fire Atronachs and Frost Atronachs, although the two enemy clans fought over ownership. An apprentice battlemage from the Battlespire, following the retreating Daedric armies, helped to partially liberate the Shade Perilous, although it is unknown whether or not the Nocturnals regained control of the area. It is likely that Imago Storm relinquished Clan Dagon's hold on the realm after assuming control following Dagon's banishment. The Crow's Wood is an uncanny pocket realm of the Evergloam. 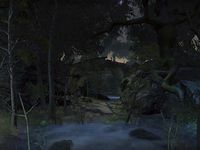 It was made to resemble a nightmarish forest, although it is a poor imitation compared to Tamriel. It is inhabited by the feudal Blackfeather Court, sentient crows who view themselves as the realm's rulers. Other inhabitants include giant bats, ghosts, wolves, spiders, wisps, wispmothers, bears, and soul wraiths. The realm was once ruled by a powerful soul wraith called Ghyslain, although he was banished under unknown circumstances. A hagraven known as the Crow Mother then came to rule the realm as the head of the Blackfeather Court. 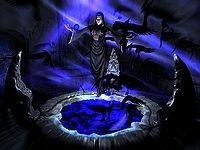 Sometime in the Second Era, a Dunmer member of the Mages Guild named Rulantaril Oran discovered the Crow's Wood in his search for powerful forgotten spells. He created an enchanted chest to open a portal to the realm, and hid it in a small cave near the city of Davon's Watch in Morrowind. He attempted to gain favor with the Crow Mother by confessing his love for her. However, his trickery failed, and the hagraven imprisoned him in her tower. His son, Telbaril, entered the realm in search of his father in 2E 582. Groups of adventurers, enticed by the chest, began to enter the Crow's Wood as well. Telbaril asked for help in searching for his father, but it is unknown if Rulantaril or the Crow Mother survived the ensuing hunt. Ghyslain was also summoned back to the realm, but he was destroyed by the adventurers. 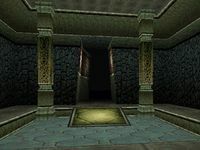 Using the enchanted chest, the Mages Guild Order of the Eye sent guild members into the pocket realm to recover the Nightlight, a strange relic of Sheogorath which had supposedly ended up in Crow's Wood due to the unexpected effects of the Planemeld.